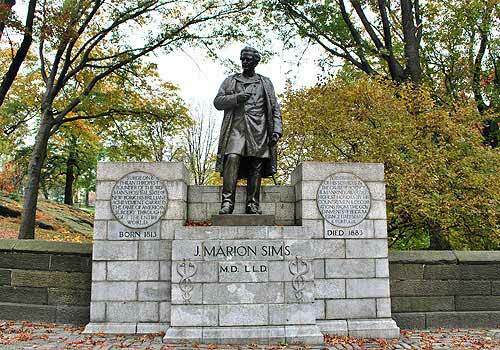 The bronze and granite monument honoring Dr. James Marion Sims was previously located along the Park's perimeter on Fifth Avenue and 103rd Street. By order of Mayor Bill de Blasio, NYC Parks has relocated the statue to Green-Wood Cemetery in Brooklyn, where Sims is buried. Plans are being developed to commission a new monument on this site. Visit NYC Parks for more information about the sculpture. Perimeter Wall at Fifth Avenue and 103rd Street.